The iconic Golden Gate Bridge is even more magical up close. photos by Christina Lalanne. From city streets to dirt trails, you don’t need to leave the the city of San Francisco to get some exercise or solitude. And you definitely don’t need a car. Armed with a $2 bus ticket and some good walking shoes, the following three hikes offer inexpensive and meaningful ways to see the country’s most charmingly good-looking city. A detailed map is essential. Bring your smart phone or buy a physical map; try The Rough Guide to San Francisco Map or Great Pacific’s transit map. 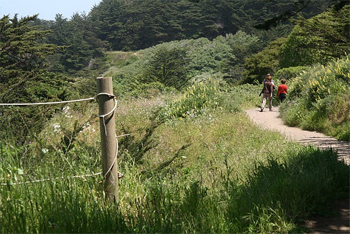 Starting at a bluff overlooking the Pacific, the Lands End Trail is an easy stroll along an uneasy coast. Crashing waves, lush vegetation, and dirt trails lend a feeling of wild isolation all within the country’s second densest city. Originally pushed through the jagged northwestern edge of the city to make way for a 19th century tourist train, the right-of-way offers views of the distant Golden Gate Bridge and green mountains meeting the sea. Lands End runs parallel to the water route taken through the Straits of the Golden Gate by conquistadors and gold rushers, returning soldiers and hopeful immigrants. Today only Chinese merchant seaman and private boats trace this historic water route, but hikers can still imagine themselves as explorers, walking the Lands End Trail with almost the same views and anticipation as the thousands before them. Practicalities: The trail starts at a new parking lot near the intersection of Point Lobos Avenue and 48th Avenue. This is also the last stop on the “38-Geary” city bus which departs at downtown’s very central Union Square (Geary Boulevard at Powell Street). The trip takes 30 minutes; do not board buses that list the Veteran’s Hospital as the terminus. The Lands End Trail will spit hikers out at Eagles Point overlook just a half block away from the intersection of El Camino del Mar and 32nd Avenue. A walk one block south on 32nd Avenue, to 32nd and California Street, is the eastbound “1-California” bus stop, taking travelers right back downtown. Pack a lunch from downtown or eat at the elegant Cliff House Restaurant (1090 Point Lobos Blvd; 386-3330) or at the all-American Louis’ Restaurant (902 Point Lobos Blvd; 387-6330) before your hike. Clement Street near the end of the trail offers some of the city’s best Asian food. This hilly hike offers the best slice of life through San Francisco’s most scenic neighborhoods, walking past nearly everything iconic about the city. Starting at the stately Ferry Building, hikers charge past the city’s early Gold Rush neighborhood, through the heart of Chinatown, on up to pretty pastel Nob and Russian Hills, and end with glittering Pacific Heights views. Clinging almost entirely to Jackson Street, this urban hike – tackling a couple of very steep hills – is still challenging. Stops for sightseeing and eating can break up the uphill climb, making for an all-day activity. The landmark 1898 Ferry Building, with its gourmet food stalls, is an excellent launching point. In the morning, grab pastries at the Berkeley-based Acme Bakery (6:20am-7:30pm weekdays, 8am-7pm weekends) and coffee at Peet’s Coffee and Tea (6am-8pm weekdays, 6:30-7pm weekends). Walk north along The Embarcadero, up to Pier 1, and turn left on Washington Street, leaving the historic 20th century port behind. Make a right onto Drumm Street and a left onto Jackson, where you’ll remain for the whole hike. Keep walking for two or three blocks until you notice yourself surrounded by several one to two story brick buildings. This is the Barbary Coast, San Francisco’s original Gold Rush waterfront before landfill extended the coastline. With the discovery of gold in 1848, San Francisco in one year went from a small town of 800 to a bustling frontier outfitter of 25,000. These brick buildings are some of the only survivors from America’s original Wild West town. Continue on Jackson Street for two or three blocks and pause at Grant Avenue. 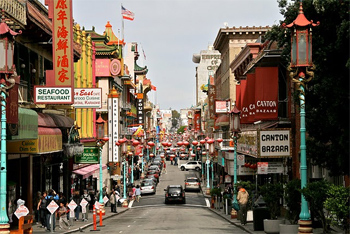 San Francisco’s colorful Chinatown is the oldest in North America and one of the most densely populated neighborhoods in the country. Enjoy the fanciful architecture: upturned eaves, lampposts decorated with twisting dragons, and hanging lanterns. Tucked into Ross Alley just past Grant is the claustrophobic Golden Gate Fortune Cookie Factory (free; 56 Ross Alley; 8am-8pm). 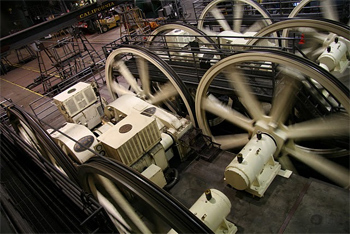 Continue three blocks up the hill to Mason Street for the big, brick Cable Car Museum (free; 1201 Mason Street; 10am-5pm), housing giant whirring gears that power the entire city-wide system. Four more westward blocks lead to a couple of lunch options: the Hyde Street Bistro (1521 Hyde Street; 292-4415) offers sit down French fare while Nook (1500 Hyde Street;447-4100) is a casual gourmet café. Cable car museum in San Francisco. The next milestone along Jackson comes four blocks down the road at Franklin Street. The historic Haas-Lilienthal House (tours $8; 2007 Franklin Street; Sundays 11am-4pm, Saturdays and Wednesdays 12pm-3pm) is a Victorian survivor from the devastating 1906 fire, when eighty percent of the city burned to the ground. Eight more blocks through Pacific Heights lead past some of the most expensive real estate in the city, finishing with a view at Alta Plaza Park. Climb to the top of the park for the bay views to the north and the city views to the south. Practicalities: To return downtown, find the northwest corner of Alta Plaza Park, or Jackson Street at Scott Street, and the eastbound “3-Jackson” bus. Stopping at popular Union Square, the bus ultimately terminates within seven blocks of the Ferry Building. Though more popularly done as a bicycle trip (see www.blazingsaddles.com or www.baycitybike.com), this bridge walk requires no uphill and is equally rewarding at its slower pace. It ends conveniently in pretty, bayside Sausalito, with its variety of restaurants. Sausalito is also the launching point for the scenic public ferry back to San Francisco. Though the bridge is San Francisco’s most famous sight, most visitors stop by only for a brief homage to a monument deserving greater contemplation. Setting out from the San Francisco side of the bridge – which can be reached via taxi or the “28-19th Avenue” city bus – a small snack bar, a gift shop, and restrooms provide the last comforts before the town of Sausalito at the end of the walk (with the notable exception of more bathrooms on the opposite side of the bridge). 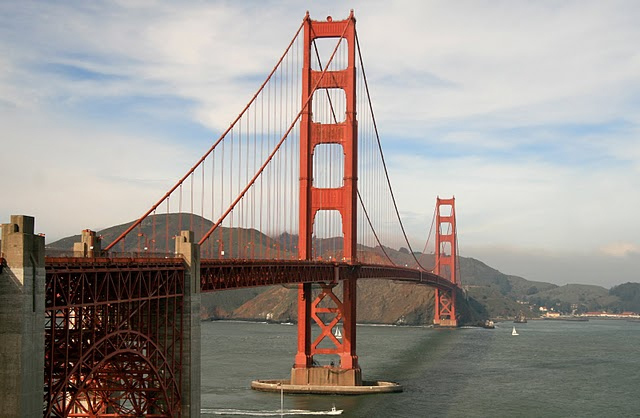 Completed in 1937, the Golden Gate has beauty and grace while retaining its mass and function. There are taller, longer, and brighter bridges elsewhere; but this remains arguably the earth’s most famous. While walking the bridge, notice the Art Deco detailing and the repeated vertical lines. Looking below, if the bay underneath the bridge were drained like a bathtub, the height of the Golden Gate Bridge would rival the TransAmerica Pyramid, San Francisco’s tallest skyscraper at 853 feet. 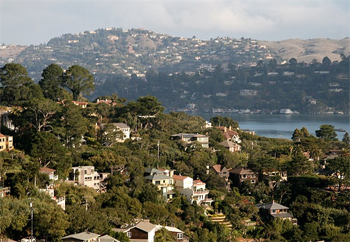 Million dollar homes in Sausalito, California, across the bridge from San Francisco. Once past the bridge, a bike path continues northward, meeting Alexander Avenue, which leads down the hill into Sausalito. With views over the bay and Angel Island – the West Coast’s immigration station – Alexander turns into South Street and intersects with 2nd Street. Turn right onto 2nd and after two blocks, right again onto Bridgeway. Once an old rough-and-tumble port town, Sausalito has embraced its postcard image and caters mostly to tourism. Along Bridgeway – the town’s main drag – are Scoma’s (588 Bridgeway; 332-9532), among the Bay Area’s best known seafood house, and Venice Gourmet (625 Bridgeway; 332-3544) with excellent take-out deli sandwiches to be enjoyed in a nearby bayside park. After a long walk, the town’s ferry provides a welcome, scenic seat from which to survey your hike. More than simply a means of returning home, the ferry passes Alcatraz and Treasure islands, sailboats and seagulls, and finishes with a panoramic city view. Practicalities: Two companies run vessels from Sausalito to San Francisco. The Golden Gate Ferry runs 6-9 ferries a day to and from the Ferry Building (goldengateferry.org; $7.85 adults; $3.80 seniors and kids 6-18). The Blue & Gold Fleet runs 5-8 ferries a day to and from Pier 41 on Fisherman’s Wharf (blueandgoldfleet.com; $9.50 adults; $5.25 kids). The San Remo Hotel: 2237 Mason Street. Historic European-style hotel, with bathrooms down the hall, in an excellent location. Rates start at $75. Nob Hill Motor Inn: 1630 Pacific Avenue. Though the décor is drab and standard, the rooms are clean and the location – in a quiet residential downtown neighborhood just two blocks from the cable car line – is perfect. And there’s parking. Rates start at $150. 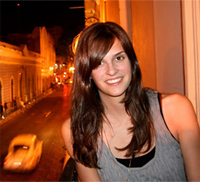 Christina Lalanne is a San Francisco tour guide who leads private walking tours at www.sfwalks.com.